This FORS image of the central parts of NGC 1313 shows a stunning natural beauty. The galaxy bears some resemblance to some of the Milky Way's closest neighbours, the Magellanic Clouds. NGC 1313 has a barred spiral shape, with the arms emanating outwards in a loose twist from the ends of the bar. The galaxy lies just 15 million light-years away from the Milky Way - a mere skip on cosmological scales. The spiral arms are a hotbed of star-forming activity, with numerous young clusters of hot stars being born continuously at a staggering rate out of the dense clouds of gas and dust. Their light blasts through the surrounding gas, creating an intricately beautiful pattern of light and dark nebulosity. 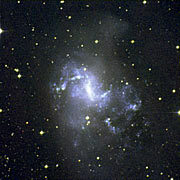 But NGC 1313 is not just a pretty picture. A mere scratch beneath the elegant surface reveals evidence of some of the most puzzling problems facing astronomers in the science of stars and galaxies. Starburst galaxies are fascinating objects to study in their own right; in neighbouring galaxies, around one quarter of all massive stars are born in these powerful engines, at rates up to a thousand times higher than in our own Milky Way Galaxy. NGC 1313's appearance suggests it has seen troubled times: its spiral arms look lop-sided and gas globules are spread out widely around them. This is more easily seen in ESO Press Release eso0643, showing a larger area of the sky around the galaxy. Moreover, observations with ESO's 3.6-m telescope at La Silla have revealed that its 'real' centre, around which it rotates, does not coincide with the central bar. Its rotation is therefore also off kilter. 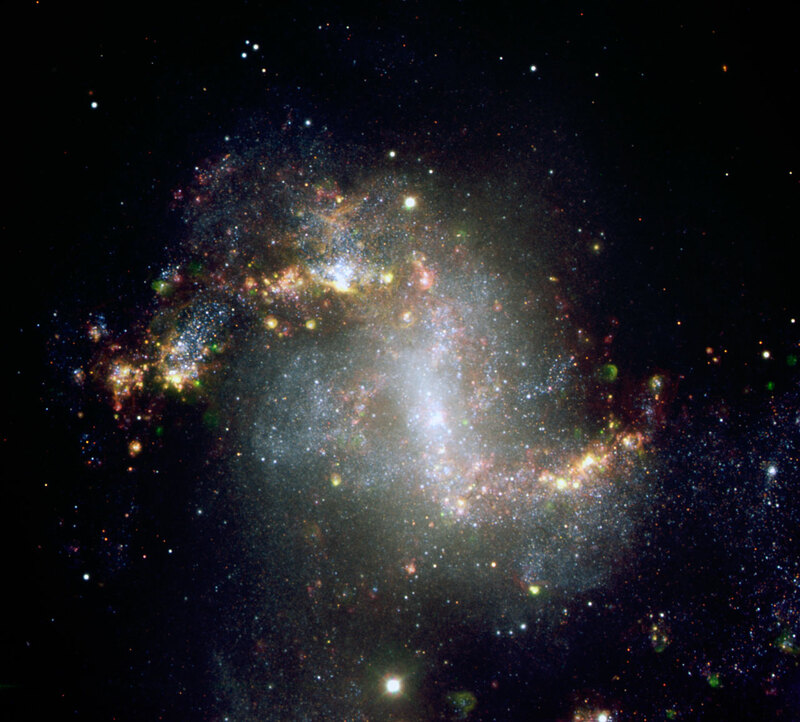 Probing further into NGC 1313's insides reveals yet more mysteries. In the midst of the cosmic violence of the starburst regions lie two objects that emit large amounts of highly energetic X-rays - so-called ultra-luminous X-ray sources (ULX). Astronomers suspect that they might be black holes with masses of perhaps a few hundred times the mass of our Sun each, that formed as part of a binary star system. How such objects are created out of ordinary stars cannot be conclusively explained by current models. 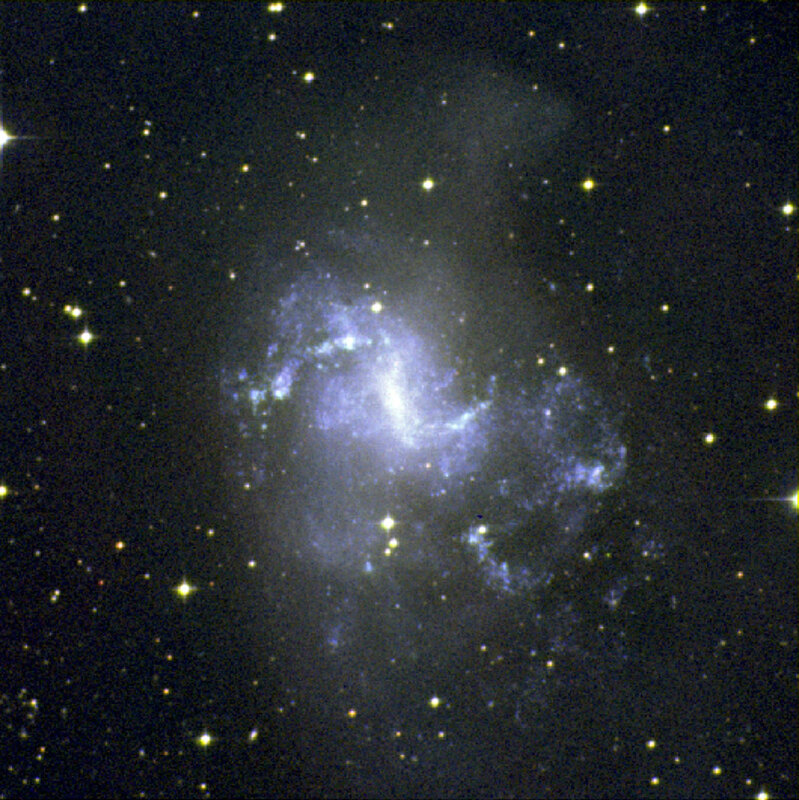 NGC 1313 is an altogether very intriguing target for astronomy. This image, obtained with ESO's Very Large Telescope, demonstrates once again how the imager FORS is ideally suited to capturing the beauty and stunning complexity of galaxies by observing them in different wavelength filters, combined here to form a stunning colour image. A high resolution image (with zoom-in possibilities) and its caption is available on this page. Technical Information: ESO Press Photo eso0643a is a colour-composite based on images obtained with the FORS1 instrument on one of the 8.2-m Unit Telescope of ESO's Very Large Telescope, located at Cerro Paranal. The data were obtained in the night of 16 December 2003, through different broad- (R, B, and z) and narrow-band filters (H-alpha, OI, and OIII). The data were extracted from the ESO Science Archive and fully processed by Henri Boffin (ESO). ESO Press Photo eso0643b is made from images from the Digital Sky Survey, obtained through blue, red and infrared filters. The data was extracted and colour-composed by Henri Boffin (ESO).